2 Blocks from the beach with remarkable Gulf views, Free Bikes, Private Pool and a garden fire pit. La Maison Bleu Heart is a New Orleans inspired home just two blocks from the Gulf of Mexico. It’s also a hop, skip and a jump away from Seaside where you will find cute shops and amazing restaurants. The home is in the heart of Seagrove Beach as well with access to Seagrove’s dining and shopping experiences. The home itself is luxury beyond your wildest dreams as every room has unique New Orleans features such as Katrina refurbished hardwood floors and Heritage glass throughout. Then there are the amenities La Maison Bleu Heart offers: an outdoor entertainment space, private pool, garden area with fire pit, gas BBQ, and outdoor dining area for the whole family to enjoy. The inside is as opulent as the outside. 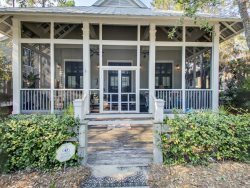 Sticking with a French décor and ambiance you rarely find on 30A this home spoils your idea of a beach vacation. The kitchen is a Chef’s dream with a Wolf range, SubZero refrigerator, two Bosch dishwashers and all the features you can think of in a gourmet kitchen. A wet bar off the kitchen is sure to impress with a high-end wine cooler and a separate ice maker. On this same level there is a formal dining area off the 3-story open staircase where you will find ample seating for your family to enjoy a good home-cooked meal. The living room sticks to the French charm you’re seeking when renting this luxury home. It has plenty of seating for the whole family to enjoy spending time together. There is also a Queen sleeper sofa in this living room for your additional guests. This first floor ends with luxurious laundry facilities and a back porch that leads to the pool and outdoor entertainment areas. The second floor opens to the outdoor front balcony which views the Seagrove landscape. This floor also boasts a Mother-In-Law Suite with King bed and custom private bathroom with a rainforest shower head. This floor also offers a Master bedroom with King bed and a Master bathroom that features a walk-in shower, claw tub and dual vanities. There is a quaint sitting area on this level that has a Queen sleeper sofa for more of your guests. The third level has private access to the back balcony that overs looks the pool and garden area. This same level has 3 guest rooms. Guest room one offers Twin-over-Full bunks with a trundle. Guest room two offers a Queen bed with guest bathroom access. The third guest bedroom is the same as the other with Queen bed and access to the guest bathroom. It’s a great floor to enjoy the garden and pool view or relax in your room on the complementary Wifi. The Fourth Level has access from the third level balcony. This is your rooftop where you can overlook all of Seagrove Beach. On this level you will find more than a view! There is a covered entertainment area with plenty of seating and a swing bed that’s prefect for dozing off on. Relax up here and feel the breezes from the Gulf of Mexico while you enjoy your beach vacation. When you’re done lounging around you can take a bike ride through seaside or Seagrove with your Golf Cart or 5 complementary bikes that are included with this home. The free golf cart rental is only available with a seven night stay during our Spring Break and Summer season. 4) CONSTRUCTION IS IN PLACE ALL OVER 30A. We cannot be held responsible for construction near the home. There is currently construction next door. 5) Free golf cart rental is included with this home when you book a seven night stay during our Spring Break and Summer Season. We loved 145 Hickory Street. The pool and house were exceptional with plenty of spaces for individuals or couples to get off on their own for more private relaxing time. We loved the easy access to the square and the beach, the most perfect location we have had in Seagrove/Seaside area for the last 10 years.